8:30 AM. I am at the bar. I feel my temperature dropping quickly, as my shaking body is about to collapse. It happens so fast, as it always does. Panic attack takes on a life of its own and things collapse at a mind-numbing speed. Before things go even worse, I stop everything and run to the back room. But it was too late. The full-blown panic attack has already began. Five minutes later. The paramedics arrive. I am flat on the floor shivering. The paramedic fireman arrives with his co-worker around 50. The younger man, in his 30’s, sits down by my side looking down at me with a very concerned look. “Are you okay? What’s happening here?” I open my eyes. And wow. They sent me a very hot looking paramedic. Another 10 minutes pass. I finally gather myself and leave the cafe to go out to the ambulance car for him to check my vitals. He wraps the pad around my arm to check my blood pressure, and my still lifeless hand falls on top of his thigh. I am surprised by my own reaction and quickly remove my hand. “You can leave your hand there. Let you hand rest.”, he says. And what I heard was “You can leave your heart there. Let your soul rest.” If I saw God today, right at that moment, I think those are exactly the words He would tell me. You can leave your heart here permanently now. You are home. You are safe now. I’ve got you. Let your soul rest. Unfortunately, the time comes for me to say goodbye to the tall, strong, masculine, and handsome paramedic. He had nothing more to do for this medication refusing panic attack sufferer. I come home and drift into a long, long nap. I wake up and go to see my Beloved at the Adoration. This afternoon, nothing was more practical than finding God, seeking Him, adoring Him, falling in Love in an absolute, final way. This afternoon, after the panic attack went through my body once again, I had nothing more practical to do than going to the Adoration of the Blessed Sacrament. 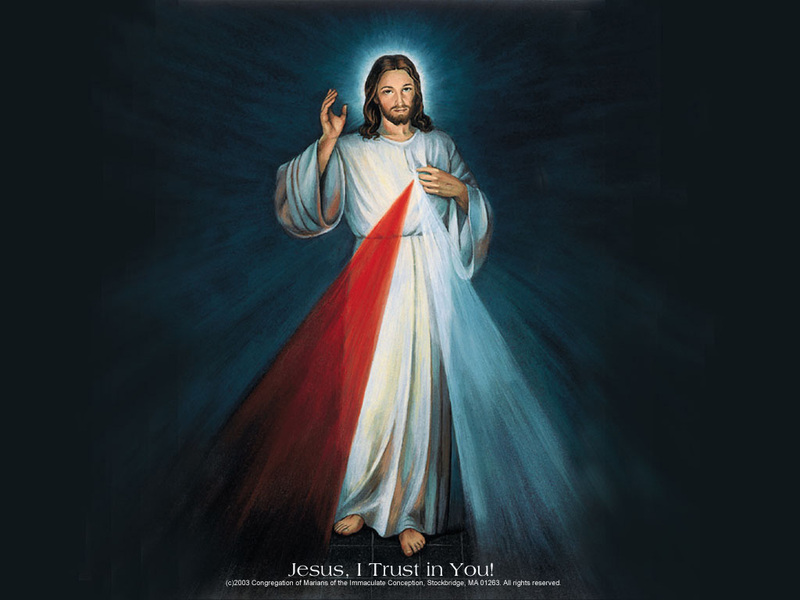 I walked up closer to the altar, knelt in front of the beautiful image of the Divine Mercy and I cried my heart out. I let my soul cry. ‘You can leave your soul here. Let your heart rest. Let your mind rest. Let your body rest.’ I told myself so. And I did. I let my entire being rest, there, at the bottom of the altar. In the safety of His strong heart from where water and blood gushed forth for the souls, I let go of my soul and spirit. My spirit quickly flew to Him, and I knew, that Love has decided everything in that moment of surrender.